I’ve been consistently pursuing the truth found in Scriptures for six months. I can’t begin to even tell you how it’s changed my life. The Bible has changed me, and the way I perceive all things. Yet, I still have this thirst for the unadulterated truth of the Word. In previous times I depended heavily on the helps in my study Bible. And, even Bible commentaries. And, while there is nothing wrong with that; I feel the reason commentators came to certain conclusions about Word, is because they took their time in Scriptures. Sometimes my thirst for the truth will bring me to a place where I only want to understand; and not to patiently take my time. Honestly, sometimes I have preconceived notions about what I’m reading. Which in turns make the Bible read, what I have already believed. I have vowed and prayed that I would like to see God clearer. And, not add on to who He is, and what His word says about Him. That brings me to my new method, Inductive Bible Study (IBS). My Pastor briefly mentioned that’s how he studies the Word. I had seen it around on the Internet, but it seemed complicated. Well, actually it’s not that complicated at all! 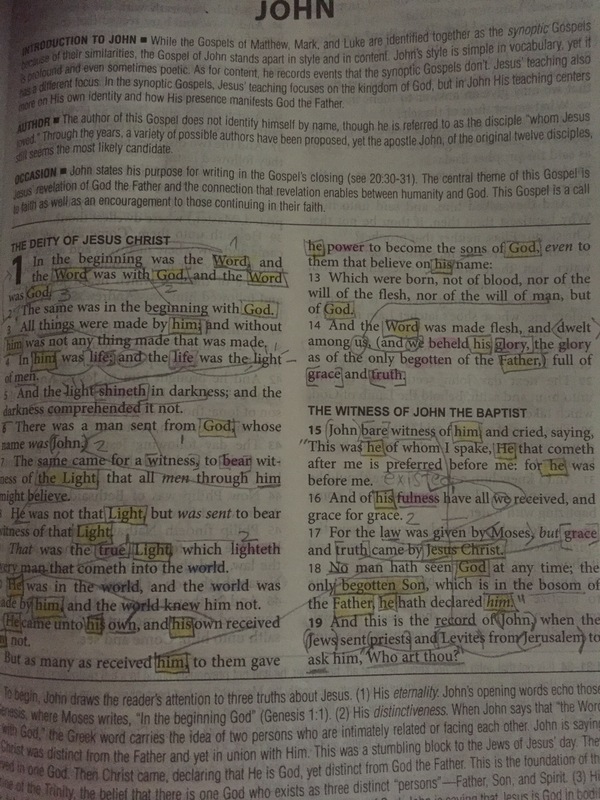 Studying my Bible this way, makes me focus verse-by-verse. It’s a very interactive way of study that calls for marking or highlighting names, places, or actions. You literally lift up every word, looking for the meaning of the verse. I’ve found it takes more time than I’m used to. But, at least I’m fully understanding everything! And, while there is so much more to IBS than I can hope to explain; I’m going to leave you some links* so you can look into this for yourselves. The question of the day: How do you study your Bible? And, out of all your studying what verse, passage or truth has stayed with you to this day? Leave me a comment so we can chat!